That's right, Retro Action Janine (In her "Janine's Genie" flight suit) and Samhain! She even has her own PKE Meter and Sniffer! --And Venkman didn't come with anything except a pack! Chew on that! --You're a girl. You're expected to be accessorized. This is definitely the "Must Buy" item for me. My Retro Action Egon agrees. Somebody posted on GBFans that the Janine/Samhain set is starting to show up in TRUs. Time to start looking at the local ones this weekend. Hope I'll be able to report soon that I have one. it was at mt TRU but out was about 47. So i had to pass on it at the time. That's about what I expected, and the guy who posted on GBFans said it was about $50. But I have a bit of cash saved for this. she is the thats going to be hard not to open. I have it now. 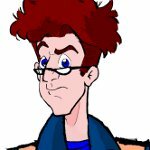 I am happy, but not as happy as Retro Action Egon is. --Yeah, like you two didn't have Twins or nothing.